This home is on a permanent foundation for buyers that are financing! 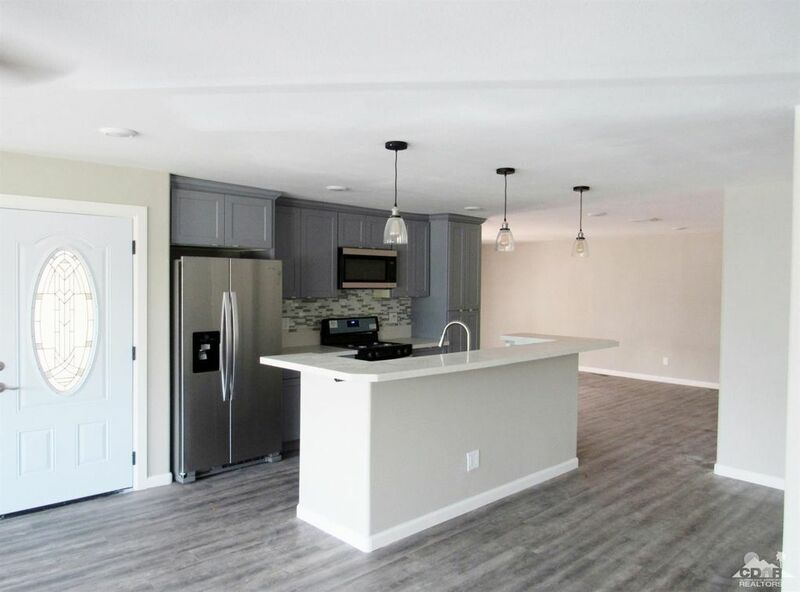 An amazing HGTV like remodel features an Open Floor Concept. The home is dry-walled throughout with dual pane windows and laminate look vinyl flooring. The door ways into each room are at an increased width for walker or wheel chairs access. The gourmet kitchen boasts stainless steel appliances with quartz counter tops and a large island with the sink and eating area. The kitchen opens to both the living/dining space and the entertaining area which is then accessible through the two sets of french doors to the front and back tiled patio. The Master Suite has a walk in closet, double sinks, and an enormous walk in tile shower with a rain shower head. The guest bathroom is adjoined to the guest bedroom convenient for both your company and your guests. This bathroom also has a large walk in tiled shower and double sinks. The side by side parking and golf cart shed allows for ease in parking. Directions: Upon entering main gate make an immediate right on Desert Greens Drive South. Continue on Desert Greens Dr South, East and North to Pigeon Springs Dr. Turn left on Pigeon Springs to Indian Creek Way. Turn left on Indian Creek. Home is on the left.